Have you found an online vendor selling Bacardi Gran Reserva Diez 10-Year? I'm generally not a huge fan of Bacardi rums, which you'll know if you look at the bottom of my shelf. But I really do like their Gran Reserva Limitada, so I thought I'd try something in the middle. Purchased for only $29.99 at Total Wines & More. This rum really impressed me! It's smooth for a 40%abv rum, and went down easy. It's a little on the sweet side, but I'm ok with that. Smells and tastes of molasses, vanilla, oak, and light spice. Simple, but very good. I usually rate rums about a point below their consensus rating, so me giving this an 8 is a very good complement, especially at this price! Edit: I finally just tried the Bacardi 8 and agree with two other reviewers that the 8 is slightly better, as it has even less alcohol burn. Paid $39.99 at a PA store. I have been staying away from the Bacardi rums (with the exception of Facundo Paraiso) but when I saw this new 10 yr old rum, I was intrigued. The bottle states a minimum of 10 yr blends which is a good start. A little light on the first sip, but fairly smooth and complex. A slight lingering burn but not overpowering. Quite nice. I'm surprised this bottle doesn't have a higher score. First sip I kinda held my nose thinking it was gonna be comparable to the bacardi 8 year. This rum is insanely smooth. Really good taste and right after you swallow it it;s gone like it was a sip of water. I can see people not liking this rum for that reason, it doesnt leave a nice big sticky flavorful aftertaste in your mouth, but I wouldnt hold it against it. The Bacardi Gran Reserva Diez 10 is lighter and less complex than Bacardi 8. It has a strong nose and an immediate alcohol burn but is then smooth enough to enjoy on rocks or with a little water. Also goes great with cola but so do many other less expensive rums. Most of you know me as the ultimate hater of Bacardi Rums. 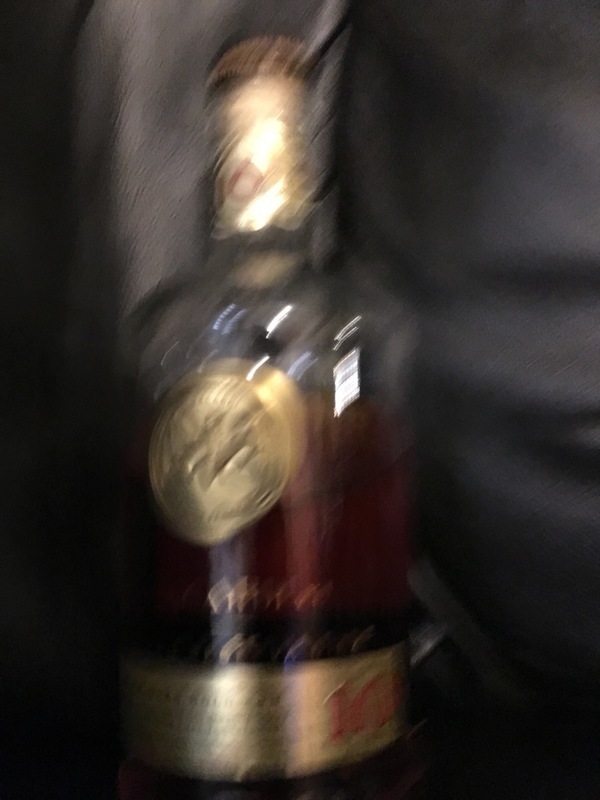 Well, since I recently took a bargain risk on their Maestro de Ron white rum and rated it as a 6, I researched reviews for this one on here and found none rated below a 6. 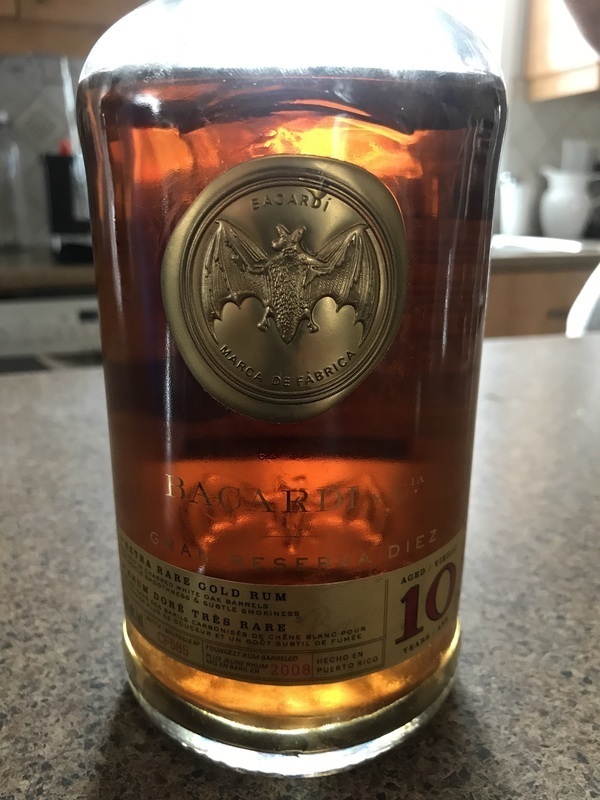 So I picked up my bottle of this 10 year old today for $33. I let it breathe in the snifter for ten minutes. The initial aroma was quite pleasant with no acetone. The bottle states that it has notes of stone fruits, bananas, and pears with a finish of caramelized vanilla and oak. I whole heartedly agree with the oak finish, but I had to look up what in hell is a stone fruit. Those are any fruits with one large pit in the center, such as peaches, plums, and a few others. Heck, why didn't they just say mangoes? So, I agree with mango and banana, but not pear. The taste is smooth going all the way down with no burn. All I can say after my first ounce is that there is no way in hell that the crap used to make their Superior, Gold, 151, and flavored rums is the same starting rum for this one. This 10 year is not what I would have expected from Bacardi and I am glad that I gave them another chance. At this price, it is also not bottom shelf crap. It is a neat sipper and I won't dare add any ice. It appears to be a dry rum with little or no added sugar. Therefore, it should last quite a while in the opened bottle. If the taste deteriorates later, I will provide my usual update. Just like these rums, my reviews are also living and breathing to change with the flow. My first taste has it ranked in my top 22% of all rums that I have rated. There were just too many better rums that I have rated as an 8 or higher for this one to qualify for that rating. This rum has a great start. Very smooth with a balance of flavors. Definitely better on the rocks. It has become my go to for relaxing by the fire. For an aged Bacardi it's not terrible, just not what I was looking for in an aged rum. Slight alcohol nose at the start, sweet flavor and minimal burn, and lingering sweetness with some oak at the end. Try it and see what you think. The first time I tried it I said “not bad”. Second time I don’t remember. This time nothing moved me. It hit it with ginger beer and a piece of an orange popsicle and it wasn’t bad. Super rhum pour le prix, il est très doux, fruité avec une note boisé. Il se bois très facilement. Au nez difficile à dire on sent peu d arôme. Meilleur que le 8 ans. You won't be disappointed with this rum. We went neet, on the rocks and tried a cola mix. I preferred it on the rocks myself. It was smooth from start to finish, probably could use more flavour in the finish but still a great choice. Thumbs up for me a very good house rum ! Alcohol on the nose followed by a sweet oak after resting. A bit of a burn with a spicey oak finish. Good enough to sip but the spicey flavour makes a graet rum and coke..
No complaints. More of a traditional rum for me. I’m more inclined to the polluted, spiced rums. A bit of a bite sraight, but solid oak flavoring. Mixes well and I thought an improvement to the 8. 7.3 True, “the Gran Reserva Diez is less complex than the 8 year old rum but has much more alcohol burn”. Barely smoothe enough go be a sipping batch, yet too expensive to sweet mix. Unlike others here, I am a Bacardi fan. Bacardi 8 is what got me started on aged rums. The Gran Reserva Diez is less complex than the 8 year old rum but has much more alcohol burn. It’s smooth enough but not enough to be a sipper. I very good mixer but for the price there are far better values. While Bacardi 8 is a solid rum and the Reserva Limitada is as good a rum as you’ll ever find, this falls short. Save the money and buy the Bacardi 8.